CONDITIONS OF SALE: If exhibited publicly, visitors should be encouraged to view this painting bare-chested. STORY: This painting is an homage (in style only, of course) to Amedee Ozenfants&apos;s "Graphics on a Black Background" (1928, oil on canvas), one of the most beautiful compositions of the past century. A common Latin proverb that glorifies macho qualities in maintaining a happy marriage is used here to give one of the most common street graffiti an artistic place among universally understood symbols. 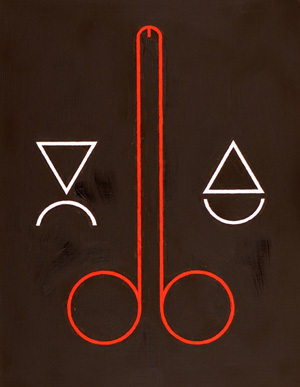 While the white triangle on the right is pointing upwards (signifying an erection) and is accompanied by a stylized smiley, the situation on the left is quite different. Their position is intentional, as this kind of proverb would normally be used by people who associate themselves with the political right. The painting is also a comment on the style of political leadership in Russia since 2000. In 2012 Putin reported an income of 3.6 million rubles, which is the asking price of this painting.